Great Kiskadee is a large bird with big head. It has brown upperparts with reddish-brown long wings and tail. Underparts are bright yellow. Its big head has bright yellow top of crown, just above black stripe. Forehead is white, and this white stripe runs around the head, above the eyes. Other black stripe starts from the bill, through eyes, extending to the nape. Chin, throat and cheeks are white. Bill is black and thick, relatively long. Eyes are black. Short legs and feet are black. Juvenile has more rufous on wing coverts, and lacks crown patch. Great Kiskadee’s call is a slow “kis-ka-dee”, but also a loud and raucous “kreah” heard all year round. At dawn, it utters raucous notes and longer variations, often repeated. 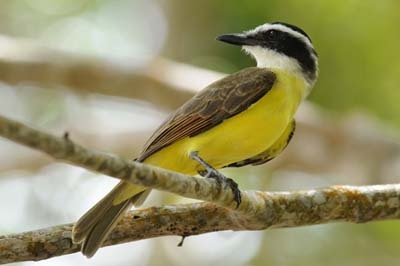 Great Kiskadee lives in varied habitats, such as city parks or open lands, near rivers or streams. It is found in scrub, thickets, open habitats near water, lakes bordered with dense vegetation. 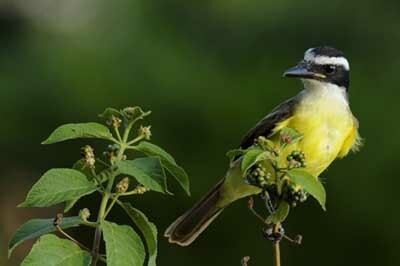 Great Kiskadee is relatively common in the eastern region of North America, Texas and Louisiana. But we can also find it in South America and Central Argentina. Great Kiskadee is a noisy and conspicuous bird. It is very active while calling. It is omnivorous. It may catch fish as a Kingfisher, perched above water and plunging into it to capture fish or amphibians. But it needs to dry its feathers after some dives. It also catches insects in midair. To kill them, it brings the prey on a branch and beats it against the wood before to swallow it. In winter, it will feed on seeds on the ground. Great Kiskadee performs shallow wing beats, and has a slow fluttering direct flight. Its body seems to be too heavy while flying. 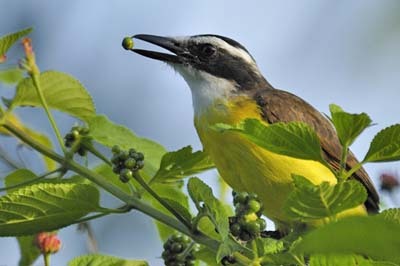 Great Kiskadee nests in trees, a thorn tree or a bush, and breeding season begins in late March. Bulky nest is dome-shaped, made with sticks, grass, mosses and bark. It is lined with soft materials, such as wool and feathers, and has a singly entry hole on the side. Nest is located in a fork of a tree where it is firmly attached, between 3 and 9 metres above the ground. Female lays 2 to 5 creamy white eggs, sparsely marked with brown and grey. Incubation lasts about 13 to 15 days, by female. Both adults feed and protect the chicks. Young fledge at about 35 days after hatching. This species produces several broods per season. Its first predator is the Coral Snake (Micrurus fulvus tener) and to avoid it, Great Kiskadee stays away from anything with its bright colour pattern. 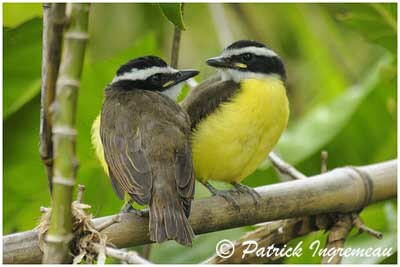 Great Kiskadee is often seen in pairs. They are monogamous and they defend strongly their nest site and territories. They are solitary nesters. They travel in pairs, and they are resident on their range. Great Kiskadee may be aggressive, ripping up other nest to rob material for its own nest. Great Kiskadee feeds on large variety of insects, but also fish, frogs, small lizards, chicks, mice and some small fruits. 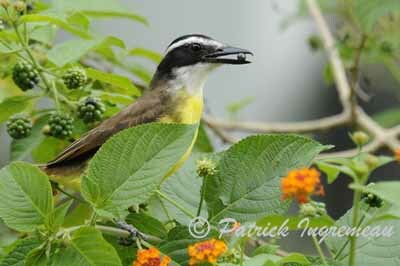 Great Kiskadee are abundant in their environment.